The 4th Annual Mark Hill Memorial Golf Outing will be held on Friday, June 7, 2019 at White Hawk Country Club. Would you like to help out the day of the outing? Please use the link below and sign-up for a volunteer position. Games on the course are very easy and don’t require any golf knowledge. The primary purpose of this golf outing is to raise funds to support local families battling childhood cancer AND for childhood cancer research. When you sign up to golf, or for dinner, or to donate a raffle prize – those funds go towards local families and much needed research to help put an end to childhood cancer. The videos on this page are a way to share stories of families whose children are battling deadly diseases and demonstrate why funding for research is so very important. Please get involved with our golf outing today! The 3rd Annual Mark Hill Memorial Golf Outing was held on Friday, June 1, 2018 at White Hawk Country Club. Thank you to all of the golfers, sponsors and volunteers who participated in this year’s event! Special thanks to Maria Pisano who was our photographer for the day. You can view all of the photos using the link below. If you would like to view the photos of the golfers from the outing, please use the link below. Hi-Res versions of these photos exist for anyone who would like a printed copy. 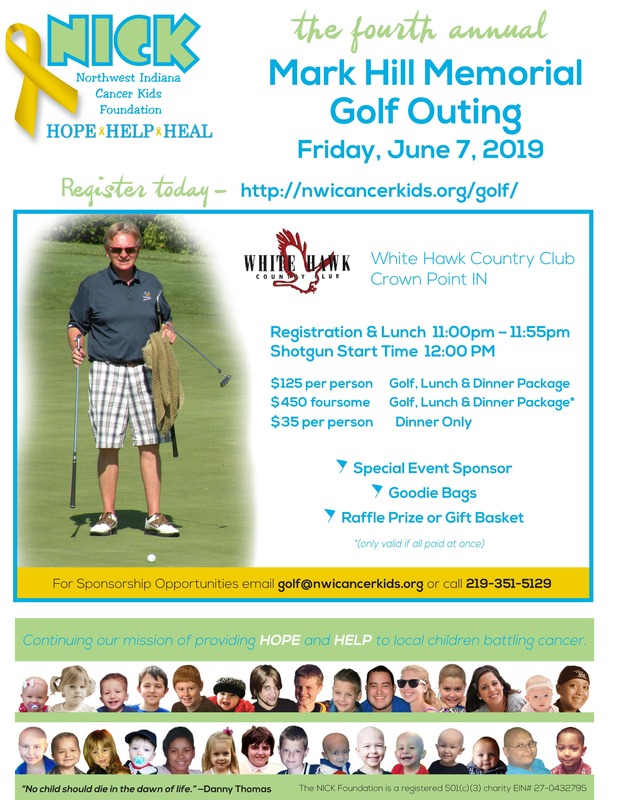 If you have questions, need additional information, or would like to know how you can get involved with next year’s outing, please email golf@nwicancerkids.org or call the NICK office at (219) 351-5129 and speak to Donna or Nicole.